First of all, I want to wish everyone in The USA a Happy Thanksgiving. I hope that you are surrounded by all of your family, friends, and loved ones today. This recipe is being posted later than what I wanted to, but I didn’t have the time to make them when I wanted to. And what the heck I love eating pumpkin desserts at this time of year. Pumpkin is not just for Thanksgiving Day, right? Plus the fact that I love mini desserts like this. They’re not only adorable, but they are fun to eat. This fall I went to my niece’s wedding and instead of a wedding cake she had tiramisu shooters and mini macaroons. They were such a hit everybody was raving about them. It was the first wedding that I had such desserts. 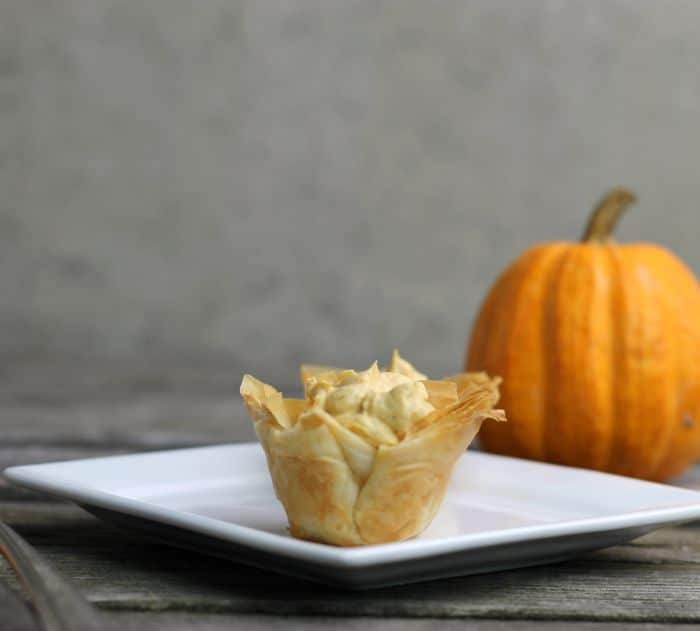 The shell for these tarts are made out of phyllo dough. Each layer of the phyllo dough is brushed with butter and sprinkled with sugar. They are then put into mini muffin tins and baked until they are light brown and crisp. 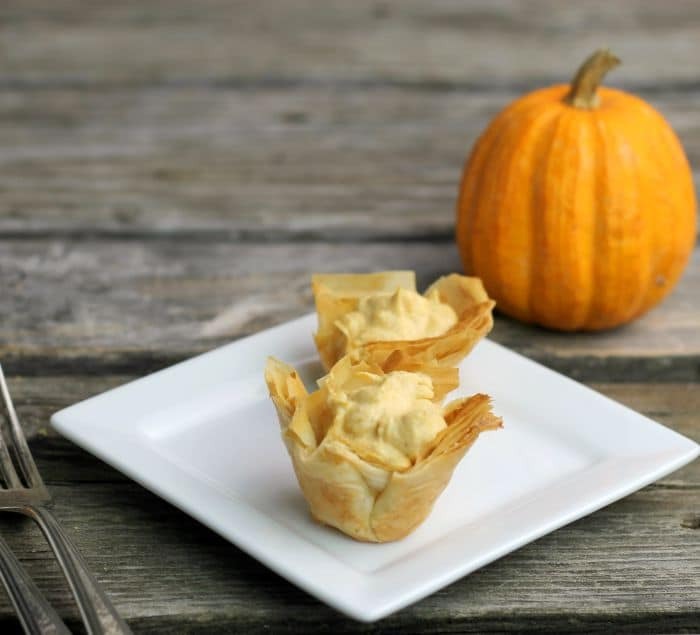 The pumpkin pie filling is a no-bake filling made with pumpkin puree, cream cheese, whipping cream and spices. When they are served they are topped with a sweetened whipped cream. I made these for a birthday dinner for our daughter and everyone loved them. I was lucky enough to get one for myself. 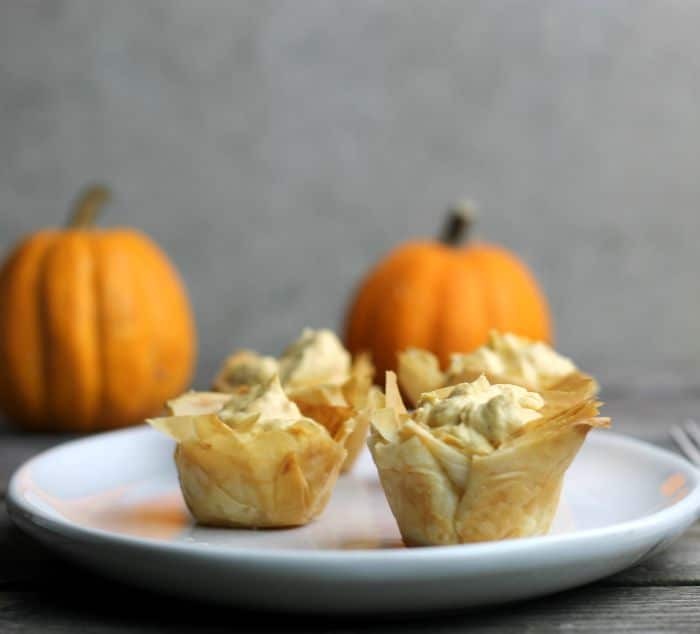 Looking for more mini dessert recipes, I hope you will try these mini pumpkin pie tarts. Place them into mini muffin tins. Using your fingers press the sheets down into the tins. Repeat the procedure so that you have 24 cups total. Place them in the oven and bake for 11 to 13 minutes or until lightly browned and crispy. Cool the shells in the tins and remove. Bring the cream cheese to room temperature. Beat the cream cheese until somewhat fluffy with an electric mixer. Beat in the sugar, cinnamon, ginger, nutmeg, and cloves. Add the pumpkin puree and beat in. In another bowl and clean beaters beat the whipping cream until stiff peak form. Add the whipped cream to the pumpkin mixture and mix until well combined. Divide the filling between the cooled shells. Serve with sweetened whipped cream. Make sure that as you work with the phyllo sheets to cover the ones that you are not working with, with a damp towel. This will prevent them from drying out and breaking apart. Crunchy filo layers and sweet creamy filling…a perfect combo! They look and sound delectable! 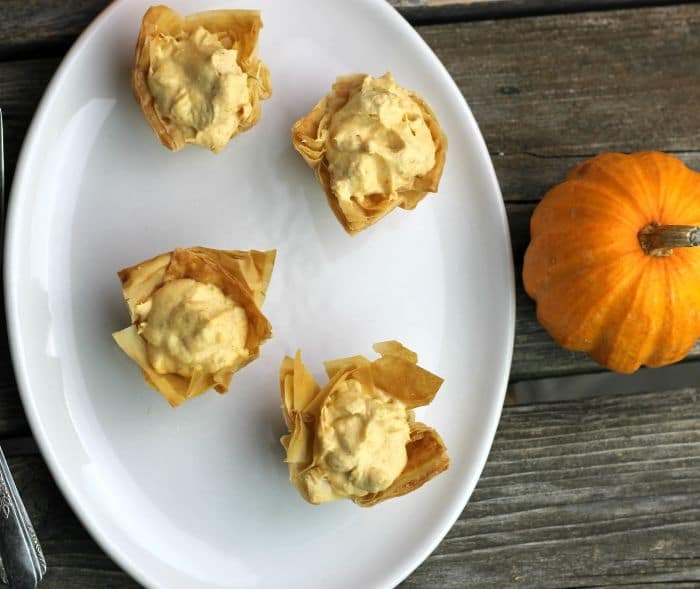 A delicious twist on pumpkin pie – I like these a lot better! Especially mixed with cream cheese. Irresistible.